The Northwest Atlantic is one of the most prolific marine environments in the world. Keeping a close watch on the state of our ocean, fisheries and marine protected species is vital and part of our duty as ocean stewards. In June of 2006, East West Technical Services was approved by NOAA’s Northeast Fisheries Science Center as an Observer Provider for the industry-funded scallop program. The program was implemented under the Atlantic Sea Scallop Fishery Management Plan through a scallop total allowable catch (TAC) and days-at-sea (DAS) set-aside program. Under this emergency action, scallop vessel owners, operators, or vessel managers are required to procure certified fishery observers for specified scallop fishing trips from an approved observer service provider. As an approved provider EWTS has been supplying qualified, competent, and enthusiastic observers throughout New England and the Mid-Atlantic region since 2006. Our observers are certified by the National Marine Fisheries Service (NMFS), and we provide them with a full compliment of data collection tools and the latest safety equipment. All EWTS Observers are well experienced and seasoned in dealing with the highly dynamic challenges that accompany the monitoring of the commercial fishing industry. EWTS emphasizes safety as a number one priority. All of our fishery observers undergo Coast Guard approved Fishing Vessel Safety Training every two years. Training includes: How to avoid incidents that compromise safety, review of safety equipment operation and deployment (i.e. 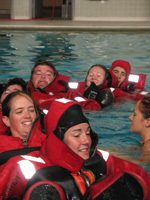 EPIRB, survival suits, life raft), in-water training exercises, identification of problems and solutions (i.e. vessel leak repair, etc) and much more. All at-sea personnel are also CPR/First Aide certified.